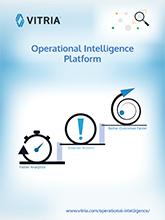 Vitria’s Operational Intelligence platform enables you to rapidly sense and respond to changing business conditions. Enterprise operations are becoming more complex due to the growing volume, variety, and velocity of data that is being generated. Additionally, this enterprise data not only resides in multiple systems, but is also resident in “silos” with multiple points of ownership across the enterprise. To meet these challenges, enterprises are looking for Operational Intelligence to take timely actions based on real-time insights. Operational Intelligence solutions address the need for timely actions by monitoring, alerting, and supporting real-time decision-making through data and analytics about current business conditions. Download this white paper to discover how you can quickly achieve real business results using advanced analytics designed for a new era of operations management.